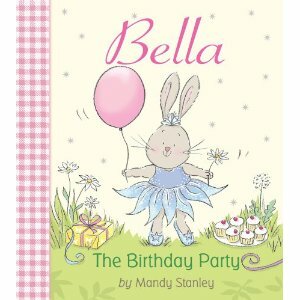 Tiger Tales has some GREAT new books out - including Bella the rabbit which is my personal favorite for the Spring. Congratulations! You are well on your way to enjoying some fun Tiger Tales titles! As for the rest of you, don't forget to check out Bella and you might want to check out some of these as well. 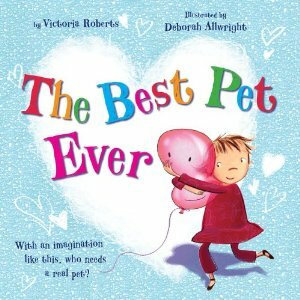 I LOVE the illustrations in this book by Deborah Allwright. They have a great 1950's flavor to them and both Bookworm1 and myself enjoyed this tale as a result. 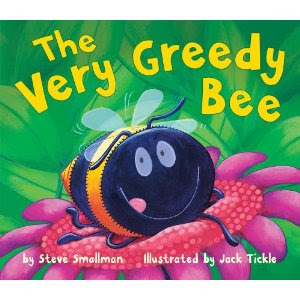 The Very Greedy Bee - is the story of a, well, very greedy bee. He finds the motherload of pollen and nectar but chooses not to tell his fellow bees. Instead he enjoys the feast all by himself and then becomes too large to fly home again! This is a cute story about greed and learning how to share. 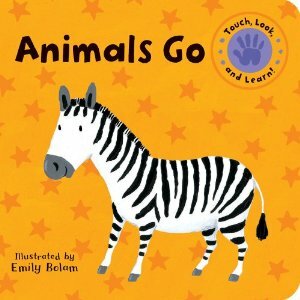 Animals Go - is one of the new releases from the "Touch, Look, and Learn" series of books. The second title just released is called Animals Talk . Both of these titles have raised areas on these board book page spreads which keeps his little fingers going! He explores each page and is really starting to differentiate between animals and the noises they make. (I love it when kids start mimicking animal noises.) Definitely a winner of a book series and these were fun to see. 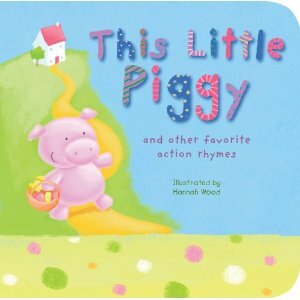 This Little Piggy: And Other Favorite Action Rhymes - is a padded board book and an absolutely amazing favorite. It contains ALL of our favorite little finger rhymes and it keeps them nice and short so that we can get through the rhyme before losing Bookworm2's attention. It includes Pat-a-Cake, I'm a Little Teapot, Row, Row, Row Your Boat and other familiar favorites. I love this title because all of the songs are familiar. There wasn't one that we didn't know and so we were able to sing and finger play our way right through this and totally enjoyed doing so. The illustrations by Hannah Wood are cute and cartoonish and have great appeal to the little guy. This book is a total winner. But then again, we think the majority of their books are winners. Congratulations Melanie L! We hope you love the Bella books. Thanks again to Carrie for offering the give-away. And thanks again for continuing to be such a great fan of tiger tales! I love Tiger Tales books and so did my students. I kept them in my classroom and the pics and rhyming text always kept kids coming back for more. Thank you for your comment on my blog. My pout was in response to a nasty email I got from somebody telling me that they stopped visiting me because I am boring now but I should still visit them and comment everyday because they are and have always been entertaining. She is delusional, but that was no reason for me to flip out on everybody. I was tired and in pain and cranky. The gift card contest is still going on. You and Barbara are entered.